PN Vietnam is a center based organization where the students are provided with educational, pedagogical and social support, in order to ensure their academic success and personal development. Within three years of their training in Passerelles numériques, all the students have to become mature, responsible and be ready to face their future professional and personal life. To reach these ambitious objectives, a team of 3 staff are taking care, guiding and monitoring the students on a daily basis. It involves providing them material, medical and psychological support, facilitating activities and organizing events, following up their academic performance and coordinating with the partner university, giving counseling sessions, implementing discipline and monitoring their daily life in the dormitory (meals, study hours, tasking…). Passerelles numériques is looking for the Education Department manager to lead this team and organize the life of the students. Reporting to the General Manager of Passerelles numériques Vietnam, the Education manager will be in charge of guiding the Education team in its daily operations, as well as handling special cases for the students. With the help of his/her team, the Education Manager will ensure that all the students are mentally, psychologically and physically healthy, embracing PN core values and developing their personal and technical skills in a dynamic environment. – Work closely with the Training Manager to follow-up students’ situation. – Work closely with External Relations Manager during internship period of students. – Maintain good relationship with the education partners and increase the number of partners who could help us in our educational mission: community services, health care, developmental activities for students. – Play an active role towards the other PN projects in Asia, leading or participating to cross-country projects. – Experience in handling youth and/or social work. Passerelles numériques (PN), a non-profit organization, is dedicated to enabling highly disadvantaged youths, through their abilities and their commitment, to access education and technical and vocational training, in the sector of Information Technology. We work to build strong employability which will allow them and their families to sustainably escape poverty, and contribute to the social and economic development of their countries. 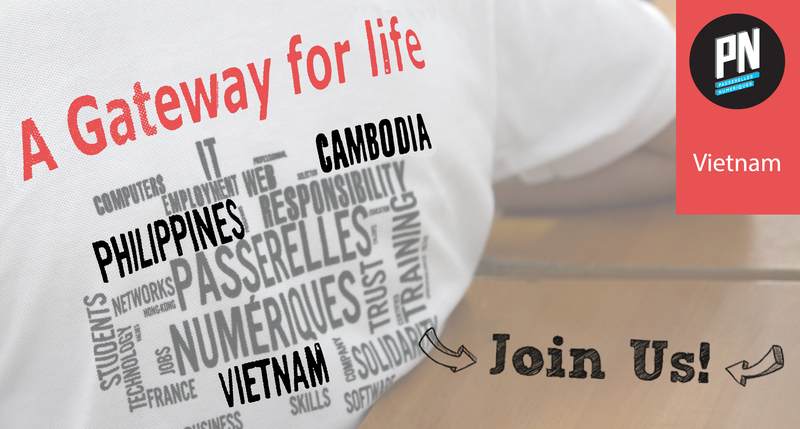 Established in Cambodia, the Philippines and Vietnam, Passerelles numériques currently trains 342 students and employs 98 people based in these three countries including a small team in France. Passerelles numériques relies on the financial and skills sponsorship of several corporate partners such as Accenture, Econocom, Microsoft and Société Générale and also receives support from individual donors. In Vietnam, Passerelles numériques started its mission in 2010, with a training center based in Da Nang, in Central Vietnam. PN Vietnam offers a three-year vocational training program for young people in precarious situations. Today, PN Vietnam (PNV) is training 130 students and graduated 258 young disadvantaged since 2010. Become a Coach: a Catalyst of Change!